In the inaugural edition of Buy Curious--a new BrickUnderground column in which apartment shoppers get feedback on their real-estate wish list from a NYC real estate agent--guest real estate broker Julie Friedman of Coldwell Banker Bellmarc Realty spells out the facts of life to a pair of newlyweds dreaming a nearly impossible real estate dream. “I’m newly married with no kids, but planning on having a baby within the next couple of years. We’d love to buy a two-bedroom apartment with washer-dryer in a doorman building within walking distance of Central Park for less than $800,000. Congratulations on your wedding and on your pro-active, forward-thinking approach to real estate, even if it is completely out of sync with the current value of the market. I respect that you are planning ahead and trying to cover all bases for a conservative, responsible purchase, yet I suspect that space will ultimately be your sacrifice in order to achieve your goals. You have targeted condos with in-unit washer-dryers and easy access to Central Park, aka the trifecta of desirability that most buyers include on their wish lists, but you are lacking the budget to support these demands. Adding in “pet-friendly” to accommodate your 45-50 lb. pooch adds another layer of complexity to the challenge. So what does an $800k 2-bedroom condo with washer-dryer close to Central Park look like? It looks like...nothing. A recent search of a variety of online real estate databases and brokerage listings, including Streeteasy.com and Douglas Elliman, yielded zero results. Your space demands simply can’t be achieved within the budgetary constraints. But please don’t be discouraged. 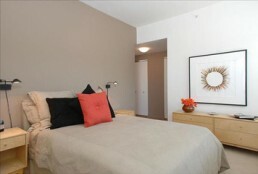 We have options if you broaden the approach to include convertible 2-bedrooms. Until a baby is born, you can have a jumbo 1-bedroom and later, add a pressure wall for a lovely room for baby. A convertible-2 will suit your needs and hold you for at least 3-4 years. It also jives with your $800k absolute cap. Upper West Side 1-bedroom/1-bathroom condo, $769,000: This move-in ready, nicely-proportioned convertible-2 is right across the street from Central Park in a doorman building. It doesn't have the washer/dryer on your wish list, but common charges and property taxes are so low ($700 total) that you can easily send your laundry out for service. Upper West Side 2-bedroom/1-bathroom condo, $875,000: This unit has a duplex layout with an open, modern kitchen with stainless appliances, as well as fair carrying charges. But a hefty flight of stairs could potentially be rough with a newborn on the horizon. 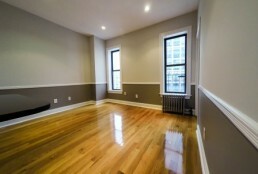 East Harlem 2-bedroom/2-bathroom condo, $769,000: If you are willing to extend your location parameters to East Harlem, this unit meets all your criteria with extra dollars to spare for furniture. 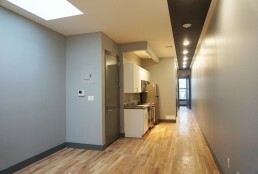 The unit is sleek, has a washer/dryer, permits pets and has a great layout. Upper West Side 2-bedroom 1-bathroom co-op, $825,000: This building is pet-friendly, has interesting turn-of-the-century details and gets gorgeous light. Please note that it’s a walk-up in an intercom building. Buy Curious is a weekly column in which NYC real estate brokers help buyers develop a realistic search strategy. Want some advice on your search? Send us your wish list. Have some more advice for these buyers? Leave it in the comments. Is an $895/month one-bedroom worth the commute to the Rockaways? 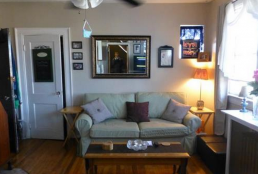 Should you grab two friends and move into this Ridgewood three-bedroom ASAP?